Do you know which player holds the single-game NCAA rebounding record? Did you know that this very record has stood for 65 years, and will likely stretch to 100? Go on, we’ll wait. To answer the question, you might first think of rebounding greats such as Wilt Chamberlain and the like. But you’d be wrong. On Valentines Day of 1953, in Blow Gymnasium on the campus of William & Mary, the Tribe’s Bill Chambers finished with 37 points and 51 rebounds against the visiting Virginia Cavaliers, who fell to W&M (for the second time that season), 105-84. Yes, you read that correctly: 51 rebounds. So who is Bill Chambers? That’s a great question for those of you too young to remember Bill — and no, we’re not just talking about remembering him from his playing career in the ‘Burg; we’re also talking about his coaching career with the Green and Gold. Yes, Bill Chambers also served as Head Coach for W&M following his playing career. And to say that he is a Tribe legend would truly be an understatement. Bill Chambers attended E. C. Glass High School in Lynchburg, Virginia. It’s important to note that he led his team to a state championship and an undefeated season (22–0) during his senior year in high school. A proven winner from the start, Bill came to W&M with supreme confidence in his playing abilities after experiencing immense success at the high school level. And he did not disappoint. When Chambers attended W&M, the program looked very different than it does today. For example, the team played in Blow Gymnasium (now Blow Hall), competed in an incredibly tough Southern Conference (which included the likes of Duke, West Virginia, UVA, Clemson, and others), and freshmen were “ineligible” to play on the varsity team. Imagine a freshman, in today’s “one and done” era, unable to play on the varsity team. Wow. As a result of that, Chambers played for 3 years on the varsity squad, racking up some incredible averages over that span. Playing in 82 games over three seasons at W&M, Chambers finished his collegiate career averaging 17.9 points and 15.5 rebounds per game — easily averaging a double double throughout his career. He also finished as a two-time all-Southern Conference selection, and during his senior year, he averaged 21.7 rebounds per game. When it was all said and done, he would finish with 1,456 career points en route to having his #32 jersey retired by William & Mary. Sheer guts, determination, and God-given ability were some of the many reasons that Bill was able to accomplish what no other has done in NCAA history. Basketball pundits have spoken on the subject before, noting that the record won’t ever be broken. Back in the 50’s, basketball was a different game. Yes, there were “run and gun” offenses that shot the ball at a high clip; however, athletes weren’t nearly as trained or as talented as they are today. Offenses also tend to run at a slower pace in the modern game, equating to far fewer shot attempts (and obviously, less opportunities for rebounds). As a result, there were a lot more missed shots in 1953. But that doesn’t take a thing away from Bill’s accomplishment. As I like to say, if it were easy, why didn’t everyone finish with 51 rebounds a game? That’s right, because it wasn’t easy. Since Chambers accomplished the feat, only one player has come remotely close to breaking the record: Marshall’s Charlie Slack, who nabbed 43 rebounds in 1954. Seattle’s John Tresvant rounds out the top 5 single-game rebounding performances with 40, but his mark represents the latest date in the top-5 list (1963). 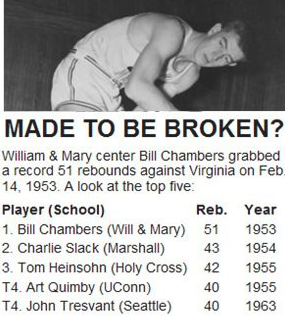 This points to just how much the game has changed since Chambers’ time in the ‘Burg and, and all but cements his accomplishment atop the all-time list for decades to come. Just the way we like it. Roll Tribe Roll. 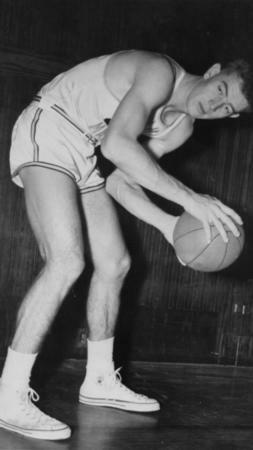 Following a successful playing career at W&M, Chambers was drafted by the Minneapolis Lakers in in the 1953 NBA Draft with their 11th overall pick (yes, the draft has far fewer rounds today). But despite the draft day selection, Chambers was cut in the preseason. Undeterred, he quickly entered the coaching ranks, beginning in the high school basketball world. 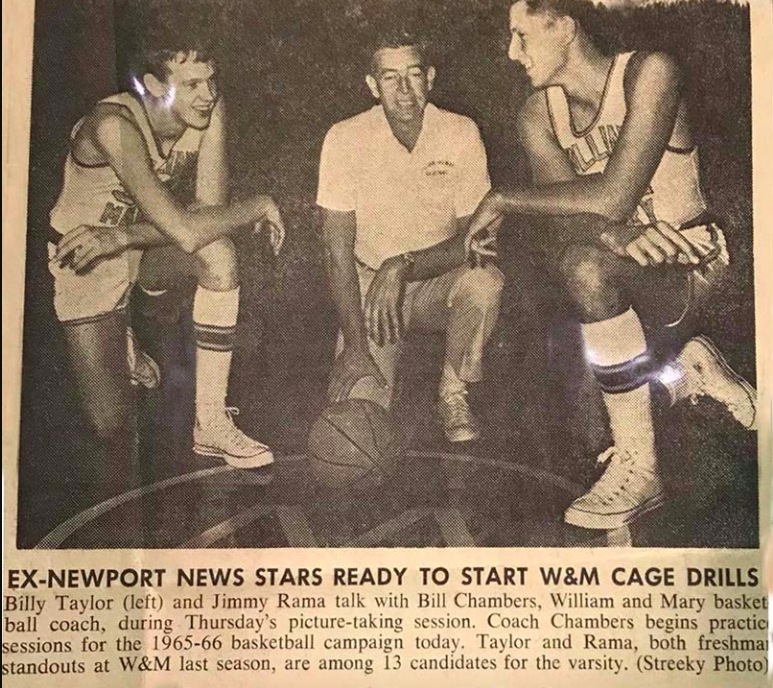 Chambers coached one season at Warwick High School before landing at Newport News High School in 1954. An incredibly young Coach Chambers would go on to guide the team to a 67-8 record over three seasons, the last two producing state championships. From there, he would make the leap to the collegiate ranks by returning to his beloved William & Mary as the Head Coach at just 27 years old. Chambers coached William and Mary for nine seasons, from 1957-66. He finished with a 113-110 record, which included a 69-63 record in the aforementioned tough Southern Conference. 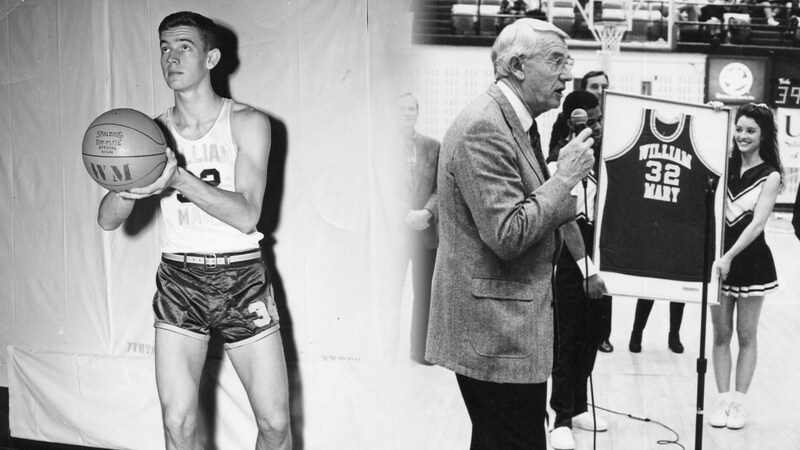 One of the highlights of Chambers’ coaching career came when the Tribe defeated West Virginia two seasons in a row while WVU was ranked in the top 10. W&M knocked out the #4-ranked West Virginia Mountaineers 94-86 in 1960 and again in the following season against a #8-ranked WVU, 88-76. The first of those upsets came over a legendary Jerry West-led West Virginia team; despite West finishing with 42 points, Chambers’ Tribe emerged victorious. The only heartbreak for Coach Chambers at W&M included the three times that the Tribe reached the league tournament final, one step from the NCAA tournament, only to fall short all three times (sound familiar?). But when Chambers retired from coaching in 1966, he finished with a win total (113) that was not surpassed by any other W&M men’s basketball coach until current head coach Tony Shaver passed the mark in February 2013. Both of Coach Chambers’ former players, in completely separate instances, noted that he was the single most influential person in their lives outside of their own parents. If that doesn’t speak volumes as to the man that Bill Chambers was, then nothing will. So the next time you visit the ‘Burg for a basketball game in Kaplan Arena, be sure to look up to the #32 banner adorning the stadium. Look up, just as Bill Chambers did 51 times when bringing down rebounds against Virginia in 1953. Look up and smile, and know that Bill is certainly smiling wherever he is, for he knows better than we do that his legendary single-game rebounding accomplishment won’t be broken for several decades, perhaps lifetimes, to come.